Rewind back to a couple years back when Lamar and Schoolboy Q were vlogging showing themselves with stacks and stacks of cash ,coining the term "eat", and throwing money around. Fast forward to now with more modest purchases and demeanors coming from both of the T.D.E artist are being publicized. The title of Lamar's newest album makes a lot of sense if you relate it to his current situation .... Kendrick is transforming into a positive influential icon for the youth across America but it seems that the industry and the media will not be comfortable with him and put him back in that positive light unless he starts pushing out those spend money ...get money...gangbang ... Drink liquor themes again.... They want to Pimp a butterfly! 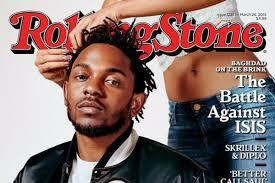 But Kendrick Lamar hasn't grown his wings quite yet! It seems like K. Dot is still wiggling around in his cocoon, leaving us to see , in his future releases, if he will emerge as something greater for the people or if big business' opinions and influence will stunt his growth. How do you feel about Kendricks newest release? Let us know in the comment section below!